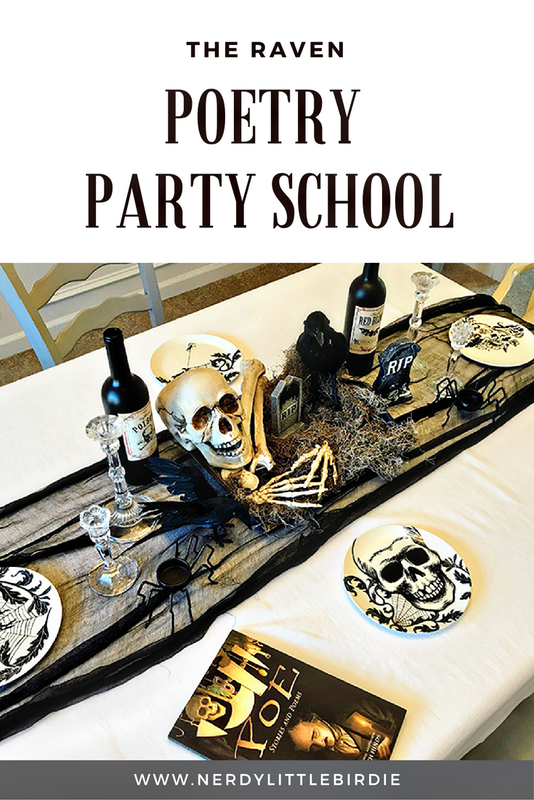 In my continued search of how I can stop hating poetry, I decided to try a Party School for poetry. 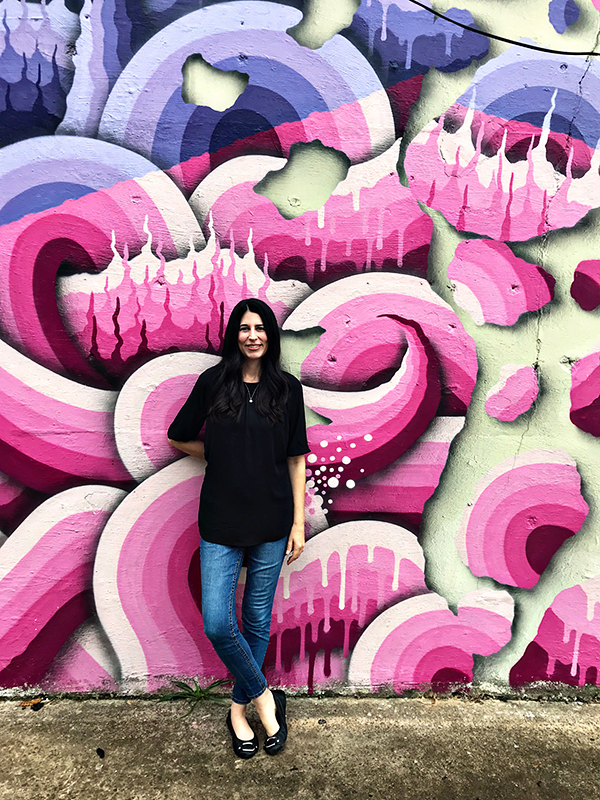 My friend, Mary, inspired me to finally take the plunge and try my first Party School. (Check out her page on hosting a party school.) She’s so good at it she’s is now writing party school ideas for the 2017-18 Brave Writer literature guides. …and this is where I must confess the ghost of my overachiever past still comes out to haunt me. (I blame Pinterest perfection for stirring up those tendencies.) I start collecting ideas and before I know it I have Pottery Barn-esques tablescaping ambition and a dozen dessert options for a party of four. 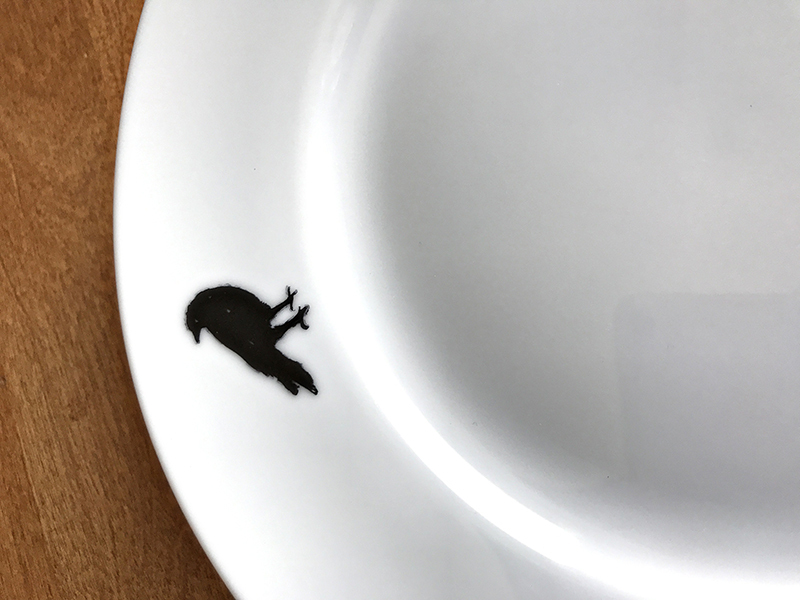 It was during the fever stage of this overachiever attack that I decided I’d make custom dessert plates. 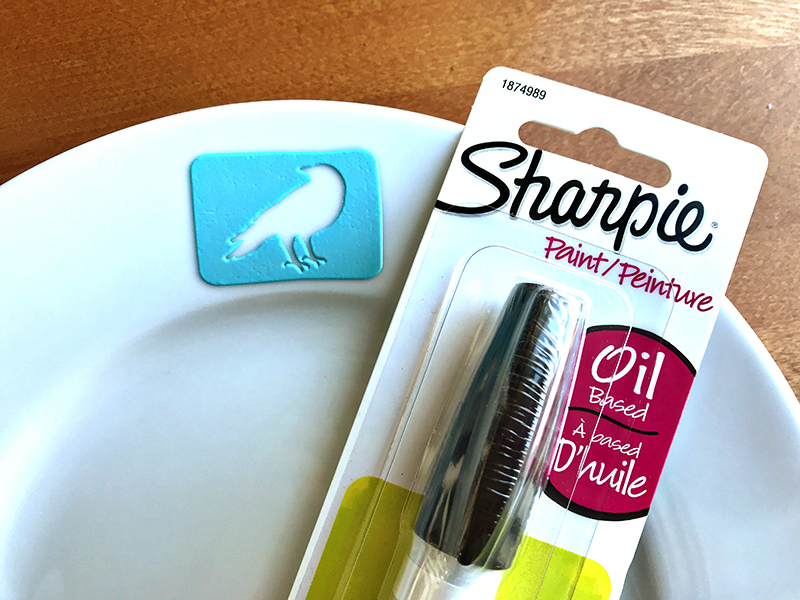 I happened to have raven-ish stencil from an old Martha Stewart notebook template and I was Pinspired to use Sharpie porcelain markers. Step back, you guys, Mama’s gonna get crafty! The first stencil turned out okay. It bled a little around the edges, but I could trace over with a fine-tipped pen to smooth it out. But the rest of it went downhill from there with all of the others bleeding the edges so much I couldn’t salvage the design. It looked like black blobs that were sorta shaped like a bird. Sigh. So much for your hand-crafted dessert plate plans, Martha-wanna-be! So what do suburban moms do when they experience a Pinterest fail but still want cute decorations? They go to Target. 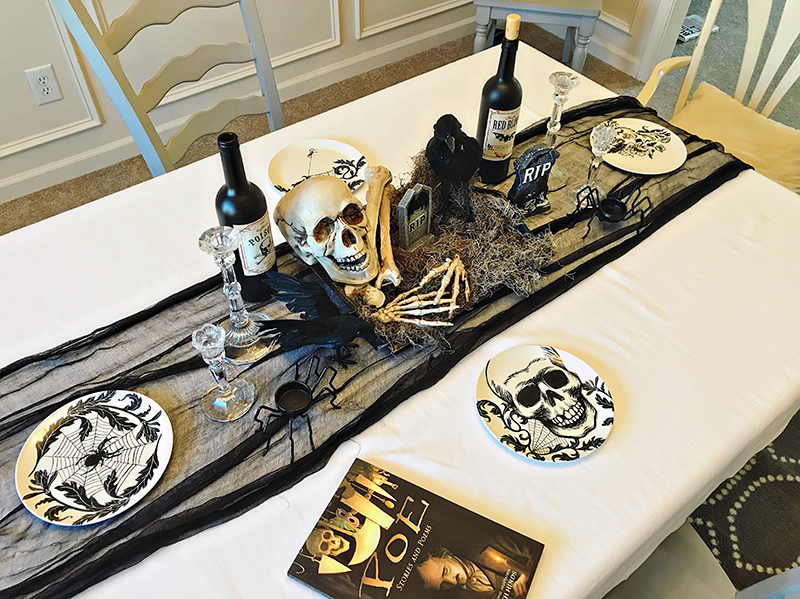 I found these cute Halloween plates that cost less than the speciality Sharpie markers I bought at the craft store. Learn from me, people, and save yourself time and money. Avoid Pinterest and just go to Target. 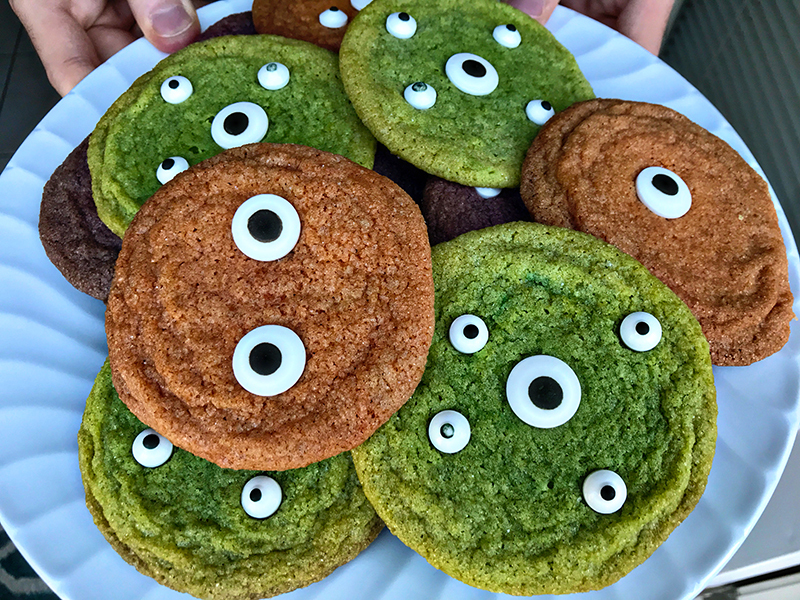 When it came to the desserts, my seventeen-year-old put a stop to my overachieving dozen-dessert insanity and volunteered to do the baking. After seventeen years of cooking for a family, you do not say no when someone else offers to do the cooking. Also, homeschoolers are required get a weird thrill when they can combine life skills with school. This means as a homeschooler I’m contractually obligated to point out when this combination happens. So here I am, pointing it out. I think his cookies turned out pretty darn cute and deserved the spotlight. Now onto Poe’s work. I found this fabulous graphic novel and ordered it. The art work in it is gorgeous. I recommend the book for any Poe fan or graphic novel fan. I also purchased The Edgar Allan Poe Audio Collection, which contains several of Poe’s works being read by Vincent Price and Basil Rathbone. Listening to a trained actor read The Raven was a tremendous success. It transformed the experience and we enjoyed the poem even more. (Afterwards I found this page of readings you can listen to for free, although the audio quality isn’t very good.) 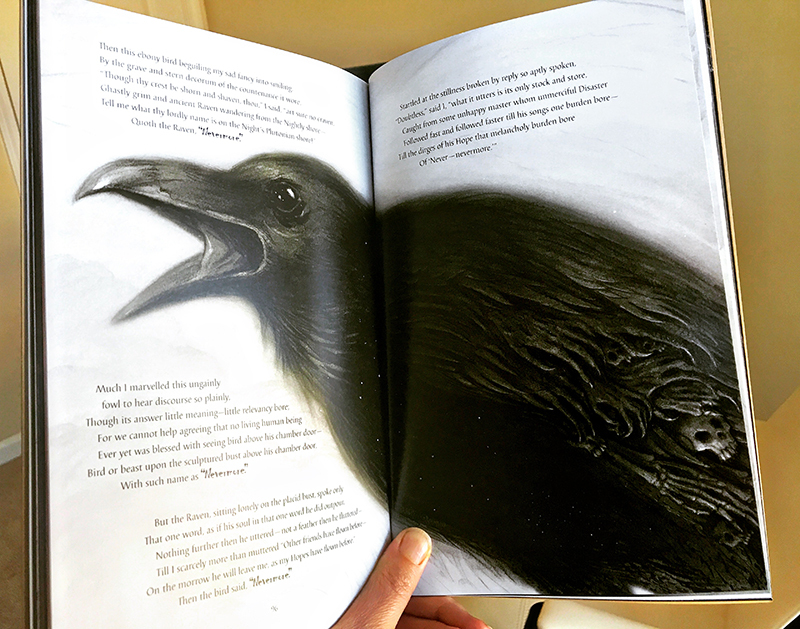 I also downloaded pdf copies of The Raven so everyone would have a copy to read along. A simple pdf google search will pull up several options. The table decorating was honestly the easiest part. I simply went through my Halloween decorations and pulled together what I thought would work. I did buy two black ravens because those are obviously a requirement for a Raven poetry party. 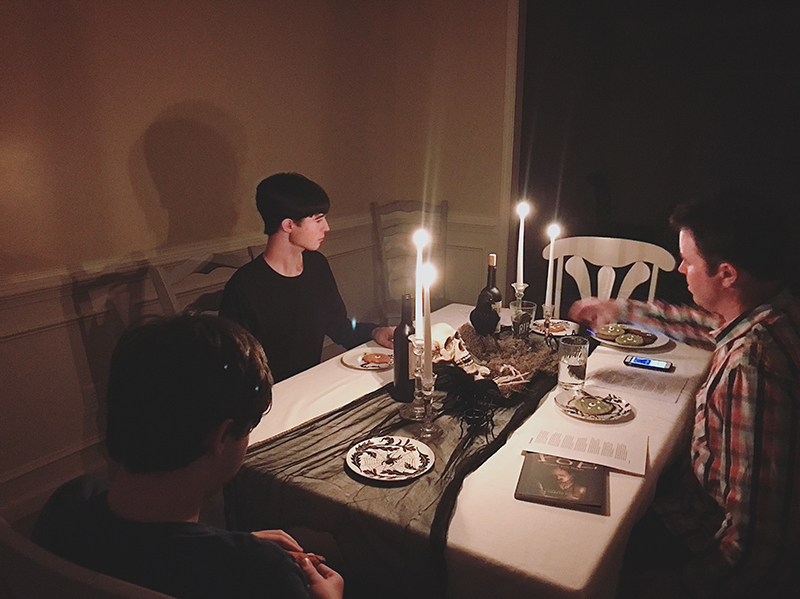 I planned this poetry party school specifically as an after-dinner dessert party so it would be dark outside, helping to set the mood for a Poe reading. I’m not telling how many cookies I ate because it’s in the rule book that calories don’t count at Party School. The next day during school, we took our pdf copies of The Raven to examine the writing techniques Poe used in the poem. We talked about alliteration, rhyming, any patterns to the rhyming, how the opening line set the mood. But before that got started, my 14-year-old made sure to tell me listening to Rathbone read the poem aloud was much better than listening to me read it. Ouch. He’s totally right, though. It did spark some curiosity over how people learn to narrate stories so well, and wouldn’t it be fun to learn how to do that. Except I’m an introvert so the only way I could even consider that as something fun to learn is if I could do it from the safety of a recording behind closed doors. Possibly even in a closet. No live performances! But back to examining the poem the next day. I’m sure there are a lot of academic aspects to study with Poe, and Pinterest would probably show you an overachieving way to do so. But I didn’t want to take an enjoyable experience and then grind it down by making it overly academic the next day. We just talked about what we enjoyed about the poem. And we had a little fun by taking the first line and then rewriting it horribly. It’s a silly little exercise, but it does illustrate the importance of word choice and style. Of course, if you’re raising teenage boys, don’t forget The Simpsons has a spoof episode of The Raven that can be a fun follow up. We enjoyed our little family party so much that I think this will be a new October tradition for us. We have burst of cold weather coming through before Halloween (a rare treat in the South), so now I’m thinking of a fireside Halloween peep roast while listening to The Pit and the Pendulum. But first I better disable Pinterest on my computer. I love it! We’re having a Poe party tomorrow night. Too bad we don’t live closer to one another; we could join forces. I know! That would be fun! That table looks pretty Pinterest worthy to me. Sounds like you pulled off a food balance between fun and academics.